OwnCloud adds API on community edition for easier integration for the developers to create web applications and mobile applications in easier way. We have quite good number of articles and guides on OwnCloud which might help you to install OwnCloud on your server or PaaS, like Installing ownCloud on Rackspace Cloud Sites, Installing OwnCloud on OpenShift PaaS (that means free of cost) and a handy guide on how to use OwnCloud. OwnCloud released the release candidate of ownCloud 5.0 Enterprise Edition, an open source CRM like solution that offers a viable alternative to commercial services that can be installed on private servers at no additional cost. The project was initially launched in January 2010 by the developer Frank Karlitschek with the intent to create a flexible solution for sharing and synchronizing files through any mobile device or computer and that would be easily accessible, safe and above all under control of the owners. In fact, the most important feature of ownCloud is that the control of data which is not sold to the third parties because the software suite can be installed on own servers. 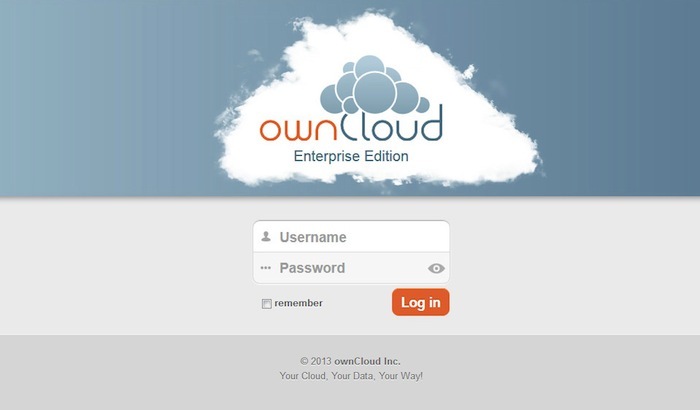 ownCloud version 5.0 Enterprise Edition, which has just been released the release candidate has been developed specifically for business. It is always based on the Community Edition, but it has added a number of features designed useful to the companies. The service service is very similar to other public cloud like Google Drive, SkyDrive or DropBox. The difference is that the files, folders, contacts, photos and everything else is stored on your server. Of course you can then access them own from a mobile device by installing an app. Data can be synchronized between the local and even shared outside the LAN of course after configuring the permissions for various users. The Enterpise version is aimed at companies that want to offer their employees a service of shared storage, but still be managed under own control. The recent news of data checks carried out by governments of unaware of citizens, demonstrate how information is never so safe. A solution such as ownCloud, however, can efficiently respond to the security needs of companies with very low cost. This new version introduces a number of innovations such as improved support for authentication through Lightweight Directory Access Protocol (LDAP) and Active Directory (AD). OwnCloud later integrated the Advanced Encryption Standard (AES), which makes the files unreadable when they are transferred to the server. It was made even easier for configuring shared resources for various users. The API (application programming interface) that offer the developers the ability to create web applications and mobile apps to take advantage of the storage service in the way they need is definitely a plus point and also it has introduced a new feature for provisioning automation tools. Of course, also it adds a redesigned interface for the users who will be using the Cloud, and for the administrators who will need to configure and manage. From the point of view of simplicity, ownCloud is as easy as the approach with Dropbox but More secure, easier to use and with several improvements from the point of view of integration of services, ownCloud 5.0 Enterprise Edition can be a viable alternative for companies. This Article Has Been Shared 1792 Times! iWork for iCloud is currently in Beta without much change in UI. One thing is quite clear – Apple is pushing the Private Cloud based Applications like Adobe. Cite this article as: Abhishek Ghosh, "OwnCloud Adds API on Community Edition For Easier Integration," in The Customize Windows, July 6, 2013, April 26, 2019, https://thecustomizewindows.com/2013/07/owncloud-adds-api-on-community-edition-for-easier-integration/.